Bring a touch of cool Scandi-style to your garden with our Alif corner dining set. 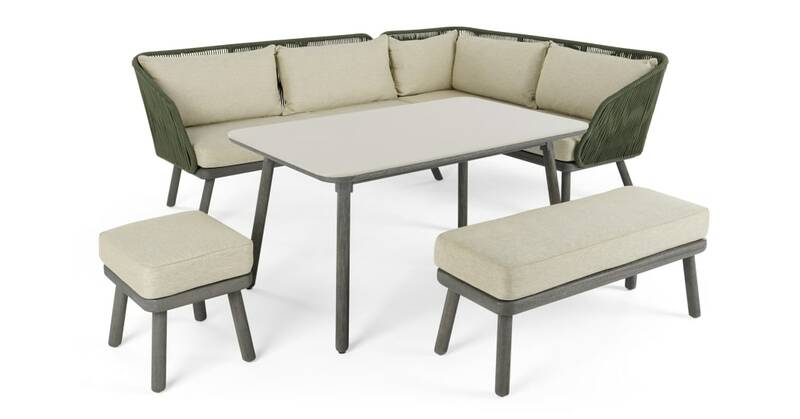 Made for relaxing, it's crafted with a solid acacia base, plus deep and comfy cushions, in green and grey, giving your outside space or conservatory a modern twist. Set comes with a table, armchair, bench, stool and sofa. On a sunny day, Alif is the perfect place to enjoy meals outside. Longer dinners are no problem thanks to the low, slightly angled back and arm rests of the seating. Comfortably seats up tp 8. A smart design, as well as a stylish one, Alif is weather resistant and can be left outside year round – just remember to take the cushions inside during heavy rain. The concrete table is easy to clean.